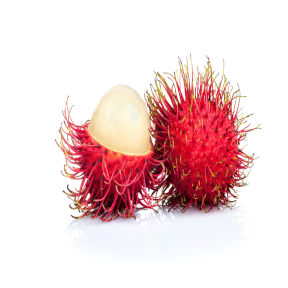 Rambutan is an edible fruit native to the Malay-Indonesian region, and other regions of tropical Southeast Asia. It is closely related to several other edible tropical fruits including the lychee, longan, and mamoncillo (Spanish Lime). The fruit flesh is translucent, whitish or very pale pink, with a sweet, mildly acidic flavor very reminiscent of grapes. Rambutans are high in fiber, an excellent source of iron and Vitamin C.
Handling: To eat, peel off skin and remove the grape-like flesh. Caution, contains pit. Store Rambutan in a plastic bag inside refrigerator for up to 2 weeks.